From 1st-30th of June 2018, the London Festival of Architecture took over the city, presenting a diverse itinerary of groundbreaking events and presentations in architecture. After its inception in 2004, the London Festival of Architecture grew to become the largest annual architecture event in Europe. Attracting around 400,000 people in 2017, the festival is expected to have an even larger audience in its 2018 edition. Architecture professionals and amateur enthusiasts alike are all invited to enjoy a wide variety of public events held in all corners of London. 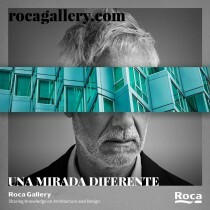 The principal theme of “Identity” shapes the month-long festival, inspiring every architect, designer, and visitor. According to festival director Tamsie Thomson, “London is the best city on earth – made more so thanks to its gloriously maddening, diverse and eclectic character. Whether you were born here or have just arrived, you can call yourself a Londoner – but what is it that makes a Londoner? What defines the city and therefore the identity of those who live in it?” This idea references the revolutionary realization of William Churchill, who believed that after humanity shapes its buildings, the buildings in turn shape humanity. London Festival of Architecture aims to unpack the city’s complex identity, and how it has changes over the years due to immigration, community changes, and even Brexit. 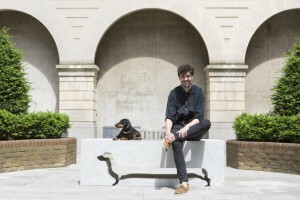 Among exhibitions, installations, and other celebrations of architecture and design, the London Festival of Design aimed to tackle pressing design issues that affect the city of London. Redesigning public seating, wayfinding in an urban jungle, and discovering the true identity of the modern and diverse city of London were among the complex themes addressed by the festival. Central to the Festival was the City Benches competition. 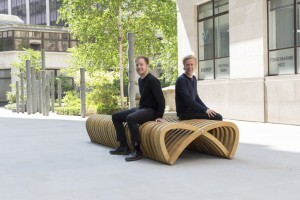 In conjunction with the City of London Corporation and Cheapside Business Alliance, the competition awarded 10 design teams with the opportunity to install public benches in the Cheapside and Eastern City Cluster areas of London. 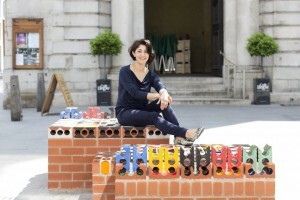 Each participant offered a different design perspective, and the resulting furniture will brighten the streets of London in the coming weeks. The 10 winning teams include Elena Boni & Studioort, Maria Gasparian, con|form architects, Eleanor Dodman Architects, Studio yu X tomos.design, Patrick McEvoy, Mills Turner, McCloy + Muchemwa, Mariya Lapteva, and Nicholas Kirk Architects. Entries top to bottom: Patrick McEvoy, Mills Turner, and Maria Gasparian. In a city as dense and busy as London, it can be difficult for visitors and even locals to navigate the urban pathways that connect major travel passageways and historic landmarks. Team London Bridge, along with the London Festival of Architecture aim to improve the appearance and navigability of London Bridge Station. After its recent remodel, the London Bridge Station lacked a clear marker to direct travelers towards nearby landmarks. 6 teams of designers were chosen as standout finalists. 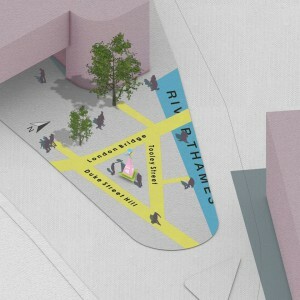 The overall winner was Charles Holland Architects, who is now tasked to transform the dull street space with a dynamic and functional wayfinding installation. Their playful and colorful design proposes two parts: a life-size rendering of the road map painted onto the street, which marks the names of major streets and landmarks, and a large sign with more elaborate directions and cultural information. The structure also features a bench to provide a space for commuters to take a moment to relax in the nonstop atmosphere of London. Instead of funneling pedestrians into busy walkways, the pyramid-shaped structure will suggest routes that are less congested, provide better quality of air, and have less noise pollution. 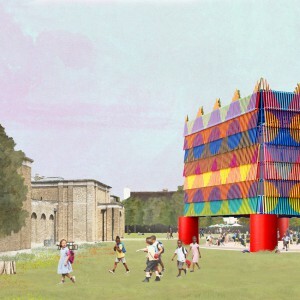 Another ongoing contest hosted during the LFA festivities decides the future of the Dulwich Pavilion, hosted by Dulwich Picture Gallery. 6 design teams advanced to become finalists in the competition to design a temporary outdoor structure to be opened in 2019. Chosen from over 150 entries, the shortlist includes Caswell Bank Architects, e10studio, Flea Folly Architects, Pricegore with Yinka Ilori, Projects Office, and PUP Architects. Until July 22nd, 2018, Dulwich Picture Gallery invited visitors to decide the crowd favorite in this second annual edition of the contest. 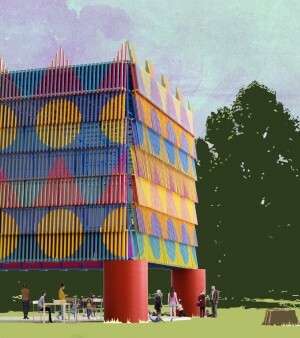 Last year, English architecture group IF_DO won the inaugural, global competition, putting themselves and the Dulwich Pavilion on the map. 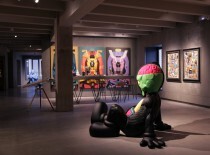 The winner of the 2019 installation is Pricegore with Yinka Ilori. Their proposal, “Colour Palace,” draws inspiration from Nigerian art, further elaborating on the theme of Identity of the festival. This is an amazing opportunity for new architects to showcase their work on a global scale in the coming year. 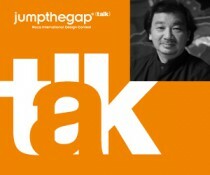 For more information, visit London Festival of Architecture. See more of Pricegore’s work here.